I performed a new install of WebLogic 12.1.2 on my Mac OSX. I could not get IntelliJ IDEA 11 to add it as a valid Application Server. The error I got was "Warning: Directory is not BEA home". The new WebLogic 12.1.2 no longer creates registry.xml in the WebLogic home directory. This file had been created by WebLogic since at least version 8. Even WebLogic 12.1.1 created registry.xml. Status="installed" BeaProgramGroup="BEA WebLogic Platform 12.1"
Notes to myself about Java on Mac OS X since I always forget and have to Google it every time. How do you find all the Java installed on your Mac? How do you set JAVA_HOME to a specific version? How do you execute a specific version of Java to run? What is the difference between the Java in /System/Library and /Library? The Java in /System/Library is the version of Java from Apple. Apple uses it for its system runtime so do not touch or modify it. The Java in /Library is what you installed from Sun. Where do you put Java Extensions? When accessing a customer's Unix server, it is helpful to allow the customer to audit the commands you execute on the server. This will log all your inputs and output into a log file named filename. (Of course replace filename with whatever you want the file name to be). To share a Unix screen terminal, so the customer can see your inputs and output in real-time, use the screen command. (Of course replace myscreenname with whatever you want the screen name to be). The great feature of screen is that the customer can type in commands from his Unix terminal and you can see the output on your screen. It is an excellent way to do pair-administration. If you want to use both script and screen at the same time, run the screen command first. The script command will not record the screen inputs/outputs if it is executed first. What is the best way to do SQL select statements in Oracle PL/SQL? For best performance of select statements returning many rows, use the PL/SQL fetch bulk collect with limit. Fetch bulk collect performs the best because it reduces context switching between the PL/SQL and SQL engine. When PL/SQL executes a SQL statement, like in a select SQL fetch, the PL/SQL engine has to pass the processing to the separate SQL engine. The passing of processing between the PL/SQL and SQL engine is called context switching and it is CPU expensive. Executing a 10,000 row select fetch in a loop results in 10,000 context switches. Bulk collect fetch batches multi-row select fetches into 1 context switch. Limit is needed so the bulk collect fetch does not consume excessive per-session memory for select queries that returns a large number of rows. A batch size of 100 is a good balance between memory and performance. Increasing the batch size above 100 usually leads to diminishing returns in performance. Unfortunately, Oracle VARRAY does not accept a variable as its initial size. Oracle recommends exiting the loop via the VARRAY.COUNT instead of CURSOR%NOTFOUND. Oracle 10g by default (plsql_optimize_level=2) optimizes cursor for-loops to speeds comparable to fetch bulk collect with limit of 100 and with less code. If you do not need to tune the bulk collect limit size, the cursor for-loop is a good compromise between fast code creation/maintainability and runtime performance. Given a file with a set of unique (non-repeating) integers from 1 to 1,0000,000 , how would you sort it? This is one of my favorite interview questions since it shows how the interviewee approaches a fairly simple and common sorting problem. 1. Initialize a bit array to a size of 1,000,000 with all the values of 0. 2. Read each number from the file. 4. Once all the numbers are processed, loop through the bit array and output all the indexes that have a value of 1. That is your sorted list of numbers. In Java, there is a built-in BitSet implementation of a bit array. The algorithm is easy to understand and implement. It is also fast and does not require a lot of memory. Below is code to convert from java.io.InputStream into a String in just two line of Java 5 code. Idea taken from "Stupid Scanner tricks"
I am a fan of Domain Driven Design. The following is how I structure Java applications to support DDD concepts. The domain layer is core of DDD. It contains the business objects state, behavior, and interaction. The domain object source code is contained in the the base.package.domain package, e.g. com.jirawat.myappname.domain package. The aggregate is a collection of associated objects that are bounded together to represent one consistent concept in a domain. From a programming perspective, aggregates represent one consistent unit for data change, enforcing data integrity and invariants. For example, the concept of a customer can be represented by a customer aggregate. The aggregate is modeled in the source code with packages. The customer aggregate is modeled in the package com.jirawat.myappname.domain.model.customer. The aggregate root is the only external access point into the aggregate. Data access and changes to the other classes in the aggregate goes through the aggregate root. This allows the aggregate root to validate data integrity. For example, the customer aggregate contains the Customer, Address, and ContactInfo classes. To access the classes in the customer aggregate, external clients will only reference the Customer object, which is the aggregate root. To change the address of a customer, the external client uses the customer.changeAddress method. To enforce the business rule that a customer must have one and only one address, the customer.changeAddress method throws an IllegalArgumentException if a null Address is passed as a parameter. The aggregate root is documented in the package-info.java Javadoc. If an class is an aggregate root, it is further documented in that class Javadoc. To programmatically enforce that external access is limited only to the aggregate root, the constructors of the classes that are not an aggregate root can be set to package-private. To ensure that external clients do not accidentally modify references to non-aggregate root objects, an immutable or defensive copy should be returned (Item 39: Effective Java). An entity has one unchanging, unique identity throughout the lifecycle of the object. Equivalently, two entities are equal if the identity is the same, even though the other attributes may be different. A customer with an ID of 101 is the same customer even though the customer's last name may have changed at some point in the object lifecycle. All entities implement the Entity interface. The code for the Entity interface is shown below. * Entities compare by identity, not by attributes. * @param otherEntity The other entity to be compared for equality. *   even though the other entity attributes are different. * from the identity only also. A value object does not have an identity. It is defined by the values of its attributes. Equivalently, two value objects are equal if all the attributes are the same. Two address objects both with the value of "123 Main St, Anywhere, MA 01730" are considered equal. This is important when comparing to see if two different customers have the same address. From an internal implementation perspective, these two addresses may be different rows in a relational database with different primary keys. But from a business perspective, these two value objects are equal since the address attributes are equal. All value objects implement the ValueObject interface. The code for the ValueObject interface is shown below. * Value Objects compare by attributes, not by identity. * the hashCode should be generated from the attribute values also. A factory is a class specifically designed to create other new objects. For example, the class CustomerFactory can be used to create new Customer objects. This can make sense from a code standpoint especially if customer creation is complex. To create a customer, business logic may dictate that postal address validation may required. It makes more sense to have the address validation proxy stubs in a CustomerFactory class instead of in the Customer object, since address validation only used during customer creation. From an object-oriented responsibility standpoint, since customer creation requires the construction of Address and ContactInfo objects, it is proper to create a new class to coordinate the creation of all three classes for the Customer aggregate root. Additional benefits/drawbacks of factories can be found in Item 1: Effective Java. All factories implement the Factory interface. 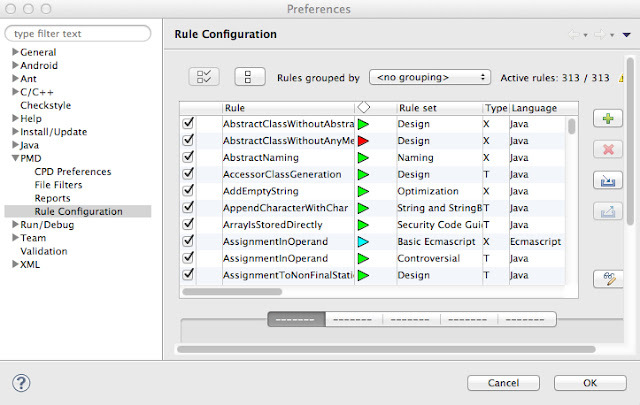 The Factory interface is just a marker interface (Item 37: Effective Java) with no method declarations. Because there are so many ways to create objects depending on the application specific business rules, it does not make sense to define a generic object creation method. The main benefit of using the Factory marker interface is that in an IDE, I can list all the implementing classes of Factory to see all the factories in a project. Factory classes will live in the same aggregate package as the class it creates. CustomerFactory lives in the package com.jirawat.myappname.domain.model.customer. It is annoying to expand multiple directories or different modules when attempting to understand a context. As a new developer reading foreign code for the first time, when I need to understand the customer context, I just want to look at the com.jirawat.myappname.domain.model.customer package directory and see all the entities, value object, factories, and repositories responsible for the customer bound in one place. Like any good thing, do not overuse factories. If the object creation logic is simple and does not reference a lot of other Entities or Value Objects, then just create a normal constructor on the class. A repository is responsible for saving and retrieving objects from the data store. The common JEE term for repository is DAO (Data Access Object). In a majority of applications, a repository is saving the state of a object via INSERT/UPDATE/DELETE and SELECT on a SQL database. All repositories implement the Repository interface. Like Factory, the Repository interface is usually a marker interface. The reason the Respository interface does not have generic methods like find(), findAll(), and store() is because some object repository may be read-only (no store method) or sometimes even write-only like logging events to a database table. I am not a big fan of using UnsupportedOperationException as I consider that a sign of a poorly planned interface. Lately with rise of Command Query Responsibility Segregation, I have been experimenting with using the interfaces CommandRepository, QueryRepository, and Repository, as shown in the code below. Like Factory, the Repository will live in the same aggregate package as the class it is responsible for. The CustomerRepository lives in the com.jirawat.myappname.domain.model.customer package. The CustomerRepository is an interface that extends Repository interface. The actual Repository implementation will live in the persistence infrastructure package, com.jirawat.myappname.infrastructure.persistence. This allows us to swap repository implementation depending on the situation. For example, in production we can use Hibernate connected to a relational database by placing the implementation in com.jirawat.myappname.infrastructure.persistence.hibernate. In unit testing, we can swap out the hibernate implementation with an in-memory model using the com.jirawat.myappname.infrastructure.persistence.inmem package. By having the client use the CustomerRepository interface, we do not have to modify the client code when we swap datastore implementations. A domain service is a stateless class that coordinates business logic between different aggregates in the domain. Operations are put in a domain service when it is not an appropriate responsibility for any one entity or value object. Domain services should only use other domain entities and value objects. 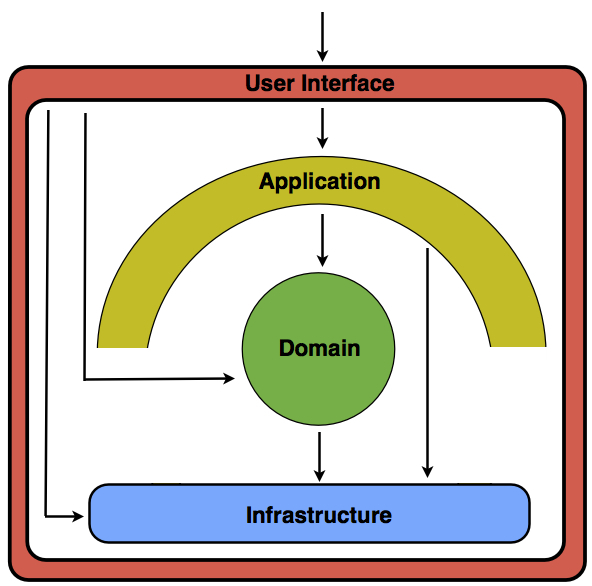 If the services uses any other layers like infrastructure, it probably belongs as an application service. Services are often abused in JEE development.Methods that should logically reside in the Entity or Value Object are placed in the service layer. As an example, the calcuateTotalPrice method is erroneously placed in the OrderService object instead of correctly residing in the Order entity itself. All domain services are grouped under one service package, e.g. com.jirawat.myappname.service. An domain event is an unique situation that is important to the domain. Events are common when using an asynchronous messaging system. When an order is delivered to the customer, the delivery system can send an OrderDeliveredEvent. * Compare if two domain events are the same. * or the comparision may happen by the event attributes like timestamp. * @param other The other domain event. The infrastructure layer is where you integrate with the third party frameworks such as Hibernate and Spring. Persistence is the most common functionality in the infrastructure layer. All persistence code is located in the infrastructure persistence package. For Hibernate, the persistence package would be com.jirawat.myappname.infrastructure.persistence.hibernate . The application layer is a thin layer to coordinate the usage of domain objects. The application layer does not have any business logic and it should not hold any domain state. The application layer is where you would implement transactions. The package name of the application layer is com.jirawat.myappname.application. The User Interfaces layer is code to support the input/output commands for the application. Generally the UI will be a HTML web application for the browser but that does not have to be the only type of user interface. Web services, JMS, and rich client are also included in the user interfaces layers. The base package for the user interfaces layer is com.jirawat.myappname.interfaces . Then each section will have its own package. A customer web UI interface is in the package com.jirawat.myappname.interfaces.customer.web while an ordering web service is in the com.jirawat.myappname.interfaces.order.ws package. xmllint can be used in Unix to format and validate XML. How do I pretty format XML? How do I use tabs instead of spaces to format XML? How do I validate an XML against a DTD? How do I validate against a XSD schema? This tutorial demonstrates how to display an array of Java enum in the Android UI. This example is also applicable if using an array or List of JavaBeans or plain Java Objects. Use the built-in android.R.layout.simple_list_item_2 to create an Android UI List. Use android.widget.SimpleAdapter to display an array of Java enum in the Android UI List. Obtain data as an array of Java enum entries. Convert the array of enum into a List<Map<String, String>> format that will be used by the android.widget.SimpleAdapter constructor. 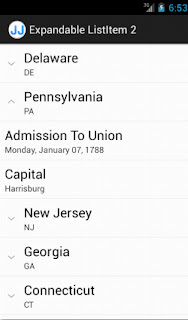 Create an android.widget.SimpleAdapter that connects the List<Map<String, String>> data to android.R.layout.simple_list_item_2. 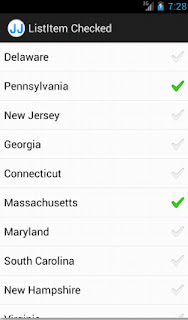 Bind the android.widget.ListAdapter using the ListActivity.setListAdapter method. 1. Create class extending android.app.ListActivity. 2. Obtain data as an array of Java enum entries, using the built-in enum method values(), e.g. UsState.values() . 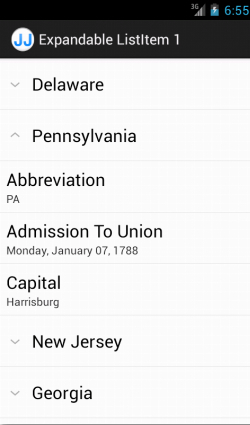 For this tutorial, we will use an enum containing the 13 US original colonies. 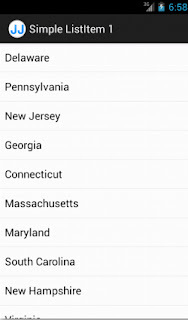 View the full UsState.java code listing. 3. Convert the array of enum into a List<Map<String, String>> format that will be used by the android.widget.SimpleAdapter constructor. The convertToListItems method converts an array of UsState into a List of Map. The List of Map will be used as part of the constructor for a SimpleAdapter. Each element in the List will correspond to a row in the Android UI list. 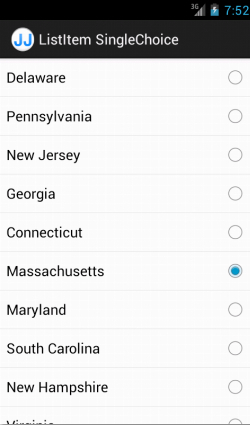 The Map<String, String> maps the attributes on the Object to the android.R.id.text1 and android.R.id.text2 UI fields. 4. Create an android.widget.SimpleAdapter in the ListActivity class from step 1 that connects the List<Map<String, String>> data to android.R.layout.simple_list_item_2. In the createListAdapter method, the constructor of the SimpleAdapter binds the keys from the Map<String, String> created in convertToListItems to the android.R.id.text1 and text2. 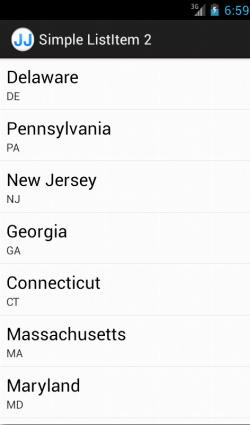 It associates "text1" from the fromMapKey array to the android.R.id.text1 in the toLayoutId array. 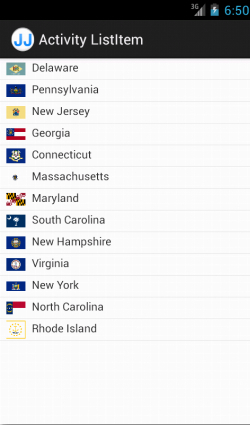 When the ListView needs to show text for the android.R.id.text1 ID, it executes a Map.get("text1") to get the String value to display, e.g. Delaware. 5. Bind the android.widget.ListAdapter using the ListActivity.setListAdapter method. View the full MainActivity.java code listing. This tutorial demonstrates how to display a Java List of Strings in the Android UI. This example is also applicable if using an array of Strings. Use the built-in android.R.layout.simple_list_item_1 to create an Android UI List. 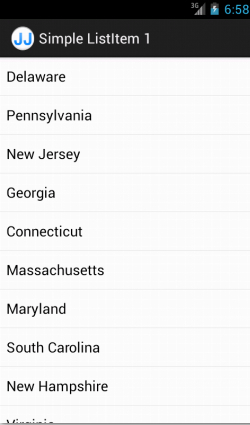 Use android.widget.ArrayAdapter to display a List of Strings data in the Android UI List. Obtain data in List of Strings data structure. Create an android.widget.ArrayAdapter that connects the List of Strings data to android.R.layout.simple_list_item_1. 2. Obtain data in List of String data structure. For this tutorial, we will use a List of Strings containing the 13 US original colonies. 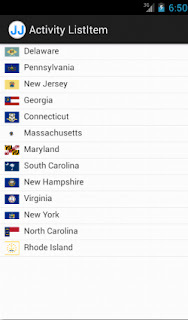 View the full UsState.java code listing. 3. Create an android.widget.ArrayAdapter in the ListActivity class from step 1 that connects the List of Strings data to android.R.layout.simple_list_item_1. 4. Bind the android.widget.ListAdapter using the ListActivity.setListAdapter method. Android has several built-in ListView layouts that you can easily use without defining your own layout XML. The source code needs cleanup and better documentation but it should give you an idea how to use the built-in layout. makes production debugging much less stressful than fumbling around Oracle WebLogic notoriously long and nested directory structures. This is especially important when you are debugging a real-time production issue on multiple WebLogic Unix servers with your eight bosses watching over your shoulders. The environment variables can be used in a number of situations. They can also directly use it in their bash shell scripts. This makes the same code portable across multiple WebLogic domains and environments without having to modify their code. and see the real paths for WebLogic. This is helpful if you have to change WebLogic directories or are on a unfamiliar server. How do I find the global ignore configuration file? How do I create a global ignore file if one is not configured? What do I put in the global ignore configuration text file? How do I configure ignores specific to a project? In the project directory, you can create or edit either the file .git/info/exclude or .gitignore. It has the same format as the global ignore. How do I show all my environment variables? How do I show a specific environment variable, like PATH? set | grep -e "^PATH="
How do I set an environment variable, like ORACLE_HOME? How do I delete a environment variable? How do I append to an environment variable, like appending /users/sbin to PATH? How do I reuse other environment variables, like adding ORACLE_HOME to PATH? How do I pass environment variables to Unix shell scripts without changing my environment? How do I make my changes to environment variables permanent? What is the difference between ~/.bash_profile and ~/.bashrc? Or setting ~/.bashrc did not make my environment variable changes permanent. For a detailed explanation, please read Josh Staiger's article. If you created an Android project in the Android Developer Tools IDE, the build.xml for Ant is not generated by default. To see more useful Android command lines, click here. When I first installed the PMD Eclipse plugin and ran a code check on my codebase, PMD displayed no errors. The first thought was, "My code is perfect!". On second thought, PMD was not configured properly. Unlike FindBug or CheckStyle, by default PMD is not configured to check for any coding violation rules. (At least this is true on my Mac Eclipse Juno.). 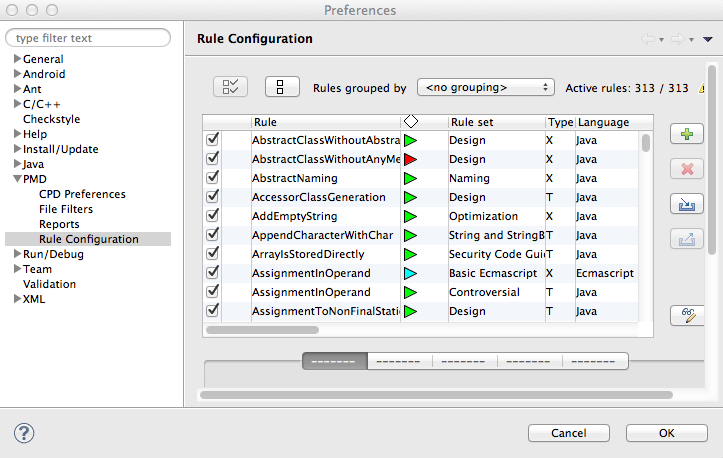 You have to go to Eclipse Preferences -> PMD -> Rule Configuration and check the rules you want to use. will output "Counter is NaN" when the button is clicked.